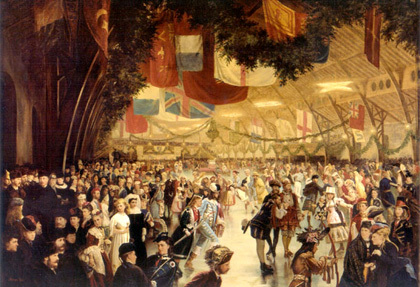 The occasion of a fancy dress skating carnival in the Victoria Rink inspired Notman’s first large composite in 1870. This event was staged in honour of Prince Arthur, who, as an officer in training with the Rifle Brigade, was stationed in Montreal. Notman declared his intention of making a record of the event, and invited those who planned to participate in the skating carnival to bring their costumes and skates to the studio and have their portraits taken for a composite photograph. One hundred and fifty people came in answer to the advertisement to don their brightly coloured costumes representing various themes and epochs. Other major covered rinks in Québec City included three built in succession for the Quebec Skating Club, the first one on the Grande Allée in 1864; a second, also on the Grande Allée, built in 1878; and a third, constructed outside the Porte Saint-Louis near the Plains of Abraham in 1888-89. This rink served residents of Québec City until the building was demolished in 1911. I dressed for the rink ball, by putting on overstockings and boots, and warm things under my seal-skin coat, and my fur cap instead of a wreath! … When we arrived I was struck with the very pretty and novel sight; the rink was lit with gas, and decorated with flags and ornaments; there were tables with refreshments on the ice, and the 25th band was playing. Montréal got its first indoor skating rink in 1859. It was built at the top of St. Urbain Street for the Montreal Skating Club.